The Relished Roost: A Bit of Irish Wisdom! A Bit of Irish Wisdom! I thought I would grace you with a bit of Irish wisdom to carry you through your weekend! I always enjoyed the humor and good sense behind some of the old Irish inspirations, and I found a few that are classic. 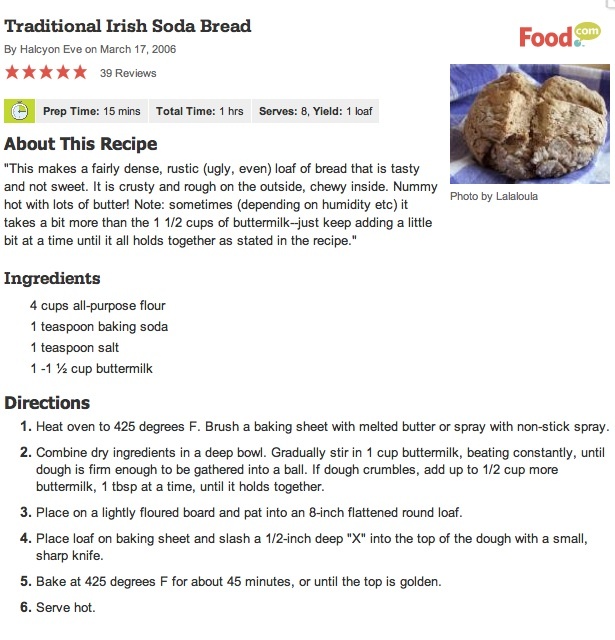 I also thought some may be getting a jump start on the Irish celebrations and would need a good "True" Irish Soda bread recipe. This is not the bread you buy in the store!! So enjoy a bit of health, happiness and bread with butter over the weekend!! A Handful of Skill is better than a bagful Of Gold! Don't be breaking your shin on a stool that's not in your way! You'll never plough a field by turning it over in your mind! God is good, but never dance in a small boat! but never forget to remember the blessings that come each day!! This recipe is the way I remember my Grand Aunt Sarah made her bread, occasionally she would add dried currants, but I loved this simple bread, warm with Kerry Gold butter!!! Enjoy!! Look amazing, and love the quotes. Love all your Irish inspired posts! I have family there too, my Dad's cousin still works the family farm in Glenbeigh Co. Kerry. An early Happy St. Patrick's Day! That is great! I am trying to go back next summer, although I hear its changed quite a bit! Have a wonderful St. Patty' sday, looking forward to your blog posts! !